WaveShop is a free, open source audio editor. The program is also bit-perfect, which means it keeps alterations of your audio files to the absolute minimum. So if you edit just a tiny section of the intro, say, everything else remains unaffected, and you can copy and paste audio without altering their contents at all. The program supports reading and writing plenty of file types, including MP3, MP2, WAV, AIFF, AU, AVR, CAFF, FLAC, HTK, IFF, MAT4, MAT5, MPC, OGG, PAF, PVF, RAW, RF64, SD2, SDF, VOC, W64, WVE and 6I files. Open your file and you'll be presented with a familiar waveform display. You're able to zoom in quickly with the keyboard or mouse, select the section you need, perhaps copy and paste it elsewhere. And the Audio menu contains some handy effects which you can apply to your chosen sample. 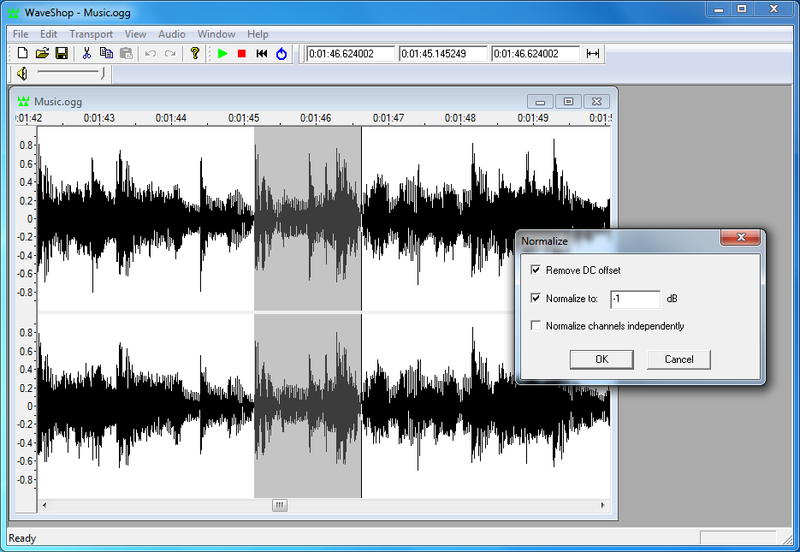 You can amplify audio, for instance, fade it in or out, or scan your file for clipped audio. A "Change Format" option adjusts the sample rate, sample size and number of channels. There are Reverse and Invert tools; you get simple Peak and RMS statistics, and there are a host of ways to work with channels. You can insert, delete or swap them, for instance; extract channels to mono files; even edit surround sound audio to decide which channel is assigned to a particular speaker. There's nothing too complicated here, then - WaveShop's author has just concentrated on the essentials. But that's just fine with us. The program doesn't have a flashy interface - there's no host of toolbars with hi-res icons - but by way of compensation we get other things, like the excellent Help file, and the smart memory management which means editing is extremely fast. That works for us, and on balance WaveShop is a capable and easy-to-use audio editor. Note that this is the portable version of WaveShop.